They were never meant to be together. As a general's daughter, seventeen-year-old Kestrel enjoys an extravagant and privileged life. Arin has nothing but the clothes on his back. Then Kestrel makes an impulsive decision that binds Arin to her. Though they try to fight it, they can't help but fall in love. In order to be together, they must betray their people . . . but to be loyal to their country, they must betray each other.Set in a new world, The Winner's Curse is a story of rebellion, duels, ballroom dances, wicked rumors, dirty secrets, and games where everything is at stake, and the gamble is whether you will keep your head or lose your heart. I've been waiting for this time to happen. To finally read The Winner's Curse and NOT be disappointed. (Yep, I will it.) And it did happen. 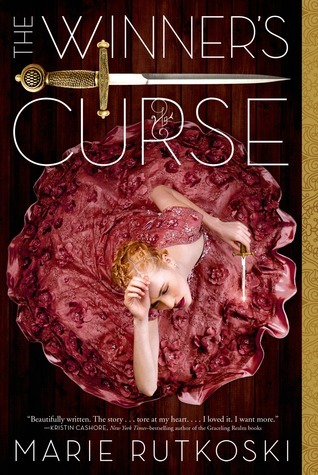 The Winner's Curse is one of my top anticipated reads for 2014 and it's one scary moment when I *finally* started reading it. When you have high hopes, you'll either be perfectly satisfied or disappointed. I'm glad it didn't fall to the latter this time. The first chapter transported me to a different world instantly. Like when Casey Newton (Britt Robertson) makes contact with the pin and instantly shows her a view of Tomorrowland (2015 film). Because of this, it was easy for me to be in Kestrel's world and story. That instant connection, Marie's beautiful writing and story-telling, and epic story (and the bookish smell too!) makes this book so overwhelming good. Like, you're having a grand tour to a majestic castle and each part you are in awe. You know what a particular part is/about but still, you're not prepared on the better things it offers. This is how it feels like when I read this book. You'd have an idea on some things/scenes, but you'll never be prepared on its beauty. I was caught off guard. Its beauty comes from the perfect amount of different things it offered: mystery, espionage, flawed yet clever and strong characters, and the complicated romance. Especially the romance. It has everything most YA romances don't have. Or rather, it doesn't have what most YA titles/romances have like insta-love, physical love, and just too much of it. Every thing was done gracefully, except maybe on the pacing and some political talks (not much a fan. My fault.) Either way, the overall turned out really good. From the cover, to the simple classy packaging, to the overall content, The Winner's Curse is totally a winner and elegant. The book was exciting and would make you curious enough, yet the ending promised so much more for the sequel. *I bought this book using the Amazon GC I won. Thanks again Carmel at RabidReads! I stopped by your blog today - cute banner. I really enjoyed this book so much more than I thought I would. The MC is so strong. I loved that. I still haven't read the second one. Glad you enjoyed it. Great review! I loved this book and the sequel. It was nice to read a book with protagonists that don't have special powers and don't fall in love on first sight. I kind of like the "political talk" too and I loved the world building. I'm glad it met your expectations. So many times there is that book that sounds so amazing and we can't wait to get our hands on it only to be disappointed in the end. She is one of those authors that I think will go on my "must read" list.